A half-ton man has died of heart failure despite a rescue attempt that saw his bedroom wall demolished so he could be taken to hospital on the back of a lorry. The 47-year-old from Juarez, northern Mexico, was pronounced dead on arrival at a hospital. 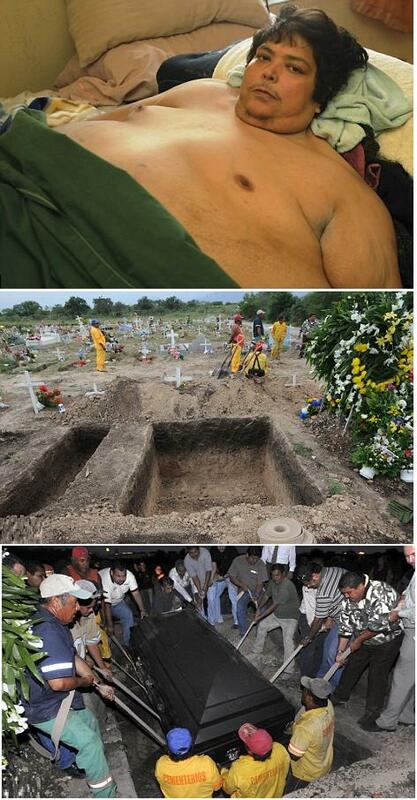 An enormous coffin had to be constructed and José Luis Garza's burial was delayed as cemetery workers enlarged the grave. Mr Garza, who weighed 70stone 10lb, had appealed on television for help tackling his weight problem - following the example of the world's fattest man, fellow Mexican Manuel Uribe of nearby Monterrey. Mr Garza said he had always struggled with his weight but fell into a cycle of depression and overeating nine months ago after his parents died within two weeks of each other. He had been bedridden for four months. I had heard that Mexicans no longer wanted to come to America. I was told things were actually better for them in Mexico now. I thought it was due to the recent problems with our economy. Now I see it's because there is a lot more food available down there now than there was previously. They don't have to keep feeding this guy.